My need to be perfect is off the charts. Possibly from being a Virgo or an only child. Maybe an inherent trait buried deep in the core of my being, but I (and anything I do) must be perfect. I have the perfectionist “all or nothing” mentality. Unfortunately, as an adult, this quality has hindered me more than helped. Are you the type of person who would rather scrap your goal entirely if it isn’t executed with the perfection you demand? Are you someone who always says you will pursue a goal “when you have more time”? If so, you may be a perfectionist, too. Less than ideal habits can form from the trademark perfectionist “all or nothing” personality. The pattern formation typically begins with procrastination and snowballs. Procrastination turns into avoidance which turns into a lower sense of self- esteem and self- worth- opening ourselves up to feelings of depression and anxiety. For those of us who are perfectionists, we don’t feel something is worth taking on if we can’t devote 100 percent of our time to the undertaking. With the multiple hats we wear today, the ability to devote ourselves to one thing solely is unrealistic. We wait and wait and wait for the right time and the right time never comes. Looking the other way with regards to something important helps ignore the pull to pursue a goal. Avoidance eliminates the option of falling short. No chance of failing if you don’t try. Whew, finally the pressure is off. Self-esteem is bolstered from accomplishing tasks and successfully completing goals. If you are a perfectionist and avoid putting yourself out there to try new things, you rob yourself of these important self- esteem boosts. The lack of accruing these “wins” under your belt throughout life can lead to feelings of low self- worth. Give yourself a deadline to begin and a deadline to finish. Make a “bet” with someone who will hold you accountable. Donate money to a cause that isn’t at the top of your list of favorites or to someone you’d rather not see flaunting your hard- earned cash if you don’t follow through with your set deadlines. Give yourself grace. Use what time you have and do what you can. Realize that doing your best with what you have is enough. You are enough. Wake up every morning and write that down a few times with your affirmations. Play out the worst case scenarios. Often, the fear we have of what will happen when we fail isn’t much more than “I would have to try it again.” Going through the possible outcomes helps me realize my fears are often blown out of proportion. Lastly, remind yourself that sharing your talents changes the world for the better. You are special! No one thinks like you, and no one has your unique skill set. How amazing is that? By avoiding pursuing your goals, the world misses out on everything you have to offer. Without another person like you in existence, talk about a loss! Here’s to giving ourselves grace and doing our best with what we have starting today. 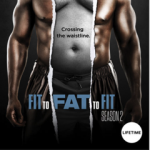 Watch us on Fit to Fat to Fit! Join the Gilbert Glute Squad! Copyright © 2016 NORTHINGTON FITNESS AND NUTRITION. All Rights Reserved.